The secular and materialistic values imported to Muslim countries through globalisation and the uncritical application of Western models and theories are changing societies from being Muslim towards a materialistic and secular one where economic value is the most critical factor that drives people’s behaviour and decisions. The real challenge for Muslim countries, then, is to develop and implement higher education curricula that reflect Islamic and cultural values while incorporating global knowledge developed by Western and other scholars. This chapter aims to achieve this balance by proposing a theoretical model that can be used for developing culturally relevant and critically reflective leadership curricula. The model is derived from Habermas’ account of critical theory and offers a critical and holistic approach to leadership teaching. It adopts an intercultural and interdisciplinary approach to learning and aims to start a dialogue between Western and indigenous sources of knowledge. 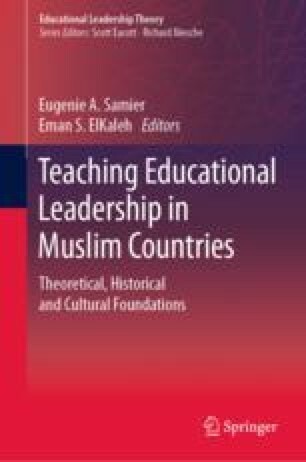 The model also proposes the content and teaching practices recommended by leadership scholars and leadership development literature internationally to provide students with a balanced and pluralistic learning experience that addresses both the spiritual and the intellectual aspects of knowledge.